We were appointed by our client to design, supply and install the DEVI mat electric underfloor heating system into a flagship development by St Edwards (Berkeley Group). 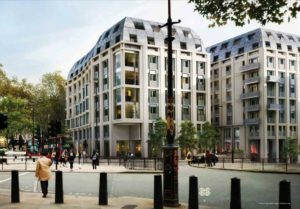 190 The Strand is a development of luxurious suites, apartments and penthouses in a central London area known as the capital’s theatre, shopping, nightlife and cultural heartland close to the River Thames. The stone, glass and laser-cut metal filigree façade strikes a presence on the corner of this historic location overlooking the Sir Christopher Wren’s Grade 1 listed St Clement Danes Church. 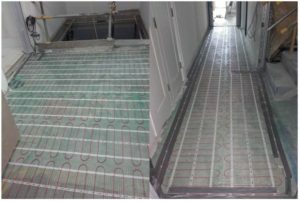 In total the area of underfloor heating was 11584m² covering blocks A, B and C of this residential new build. We installed DEVImats into the bathrooms, halls and bedrooms, all controlled by the DEVIlink control system. The DEVIlink is an innovative heating control that enables control of the entire heating system via one central point. The system consists of a centrally placed main unit used to control sensors and thermostats throughout the property. It’s a simple and user friendly system, featuring a touch screen panel enabling simple navigation. All thermostats are linked together wirelessly, the system makes it very simple to setup periods of low temperature (ie at night or when going on holiday), thus saving energy costs. Senior Account Manager Harriett Burroughs said “This form of underfloor heating is the perfect solution for large stone areas. Working on such a high specification project, the DEVImat offers fast response times and a luxurious warm finish to the stone“. If you have an upcoming project and require a quote for underfloor heating contact us today, click here to enquire.